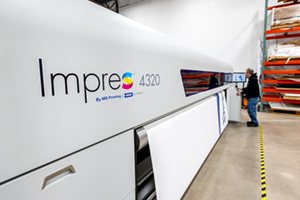 We have some of the most advanced printers in the world, in-house at our Cincinnati, Ohio facility. 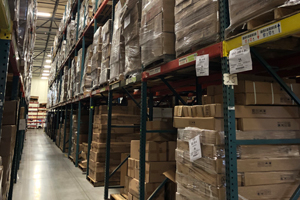 For critical large-format projects, we don’t farm out your order to some overseas company. 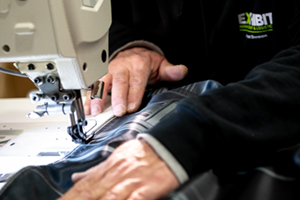 We do it ourselves, and we make sure it’s perfect and on time. Call us control freaks if you want…we’ll take it as a compliment. When every customer counts, no job is too small. Because we own our printers, we can take on even the smallest one-off print and ensure it will get the same attention as every other project we take on. That’s right. Even a single print. Not getting the service you deserve? Let’s talk. We can go big. Really big. If you want to make an impact, you have to think big. 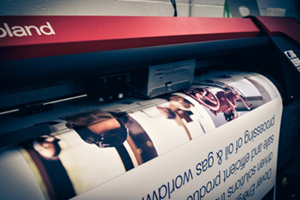 Our large-format printers can handle projects of any size – with rich, stunning color and vivid detail. And we will give service that’s so unexpectedly personal you’ll realize you don’t need a gigantic company to get monster-sized results. Even though we have some amazing capabilities, we can’t make everything in-house. That’s why we’ve partnered with some of the top global manufacturers within the signage, trade show, exhibit, and display industry. As an authorized dealer, we give our customers the ability to purchase the most popular and successful trade show hardware and graphics at highly competitive prices. 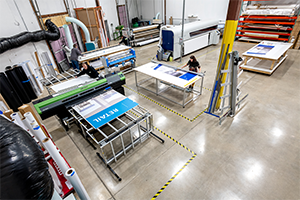 At Exhibit Logistics, we love the sounds of our large-format printers humming away. We are able to obtain the most vibrant colors available by using the Dover Digital Printing (DDP) integrated solutions, which includes the 126” IMPRES Printer, CALDERA Software, and JK Group dye-sublimation Inks. The 4320 Impres™ Soft Signage System grand-format platform produces stunning brilliant signs, strikingly vivid flags and banners, crisp and vibrant table throws and wraps, display and advertising, backlit signs, and powerful exhibition and stadium graphics, for interior and exterior applications of all shapes and sizes at astounding speed and at cost your bottom line will appreciate. 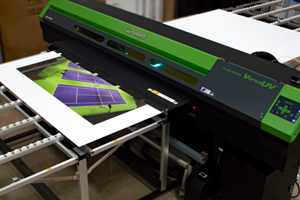 The Roland RF-640 wide-format (roll-roll) printer produces at high-speed banner stands, portable booth graphics, displays graphics, vinyl, among many others sub-straights, to meet the unique needs of every customer. 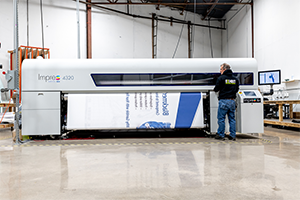 The Roland LEJ-640 wide-format UV Hybrid is a 6-color UV printer that prints on plate material as well as on roll to roll with a maximum print width of 60 in. The maximum media thickness of 0.5 in. The integrated LED lamps dry the ink. Once cured, the ink is bonded to the substrate and will not require lamination. Printing on heat-sensitive materials is possible since no heat is released. This gives us the ability to create rigid graphics for interior or exterior use, manufacturing resource signage, same day banner stands, acrylics, plastics, metal composites, etc. 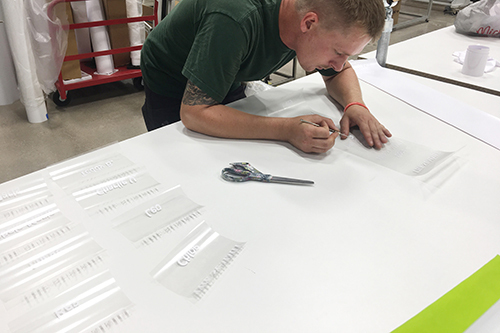 Our staff finishes each piece either direct print, laminated or dye-sublimated graphic by hand using our machines to ensure perfection. Our graphics are used for a number of products spanning trade show booths to gymnasium banners. Our team custom tailors all types of graphics: hanging structure, pillowcase, SEG graphics, table throws, tents and outdoor flags. Custom graphic finishing such as zippers, silicone edge beading, hemmed edges, and pole pockets are available as well.